A Holy Communion Service is held at 9.30 am. on the 3 rd. Sunday of every month and occasional services at other times. Please check details on the Calendar. The Church is also used for Weddings, Baptisms & Funerals and at Christmas. St. Andrew's, Little Massingham Roof Appeal. January 2017. St. Andrew's Church has been targetted by lead thieves, once again, and is appealing for support in raising funds to replace the roof. The cost is frightening and every penny will help. You can see various ways to donate via the web site click here. If you use BTdonate, then add LM Roof in the message area and that donation will be allocated specifically to the roof appeal. The work needed gets ever more urgent and your help will be much appreciated. Thank You. Little Massingham is located between Great Massingham to the south and Harpley to the north. The modern village is on the edge of the valley and enjoys excellent views across the dismantled railway towards Harpley. The village name derives from Old English and means ‘homestead of the family and followers of Maessa’. The Domesday Book records land being held by two men in Little Massingham in 1086. This is the earliest known documentary evidence for the village, but the archaeological records reveal that there was activity here at a much earlier period. The village is adjacent to the ancient Peddar's Way footpath and just south of the A148 which links King's Lynn with Fakenham. Little Massingham village is little more than a half mile north of its much bigger twin Great Massingham. There is very little in the way of residential settlement - mostly farms and cottages along the lane which links Great Massingham to the A148 and centred on a "T" junction with another narrow lane. St Andrew's church sits at that junction behind a low stone wall. 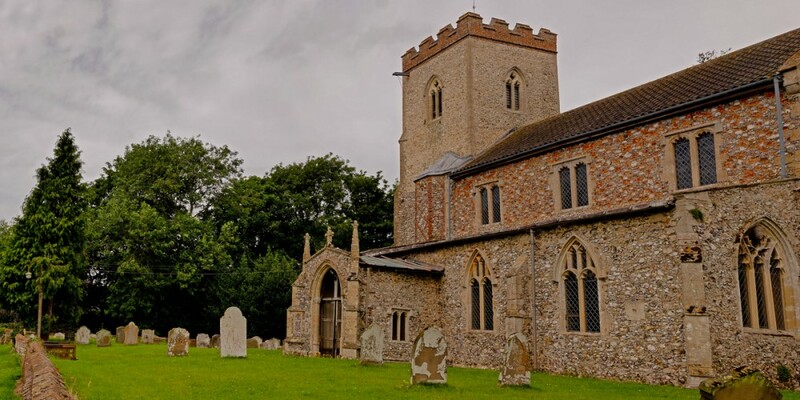 The church is of mixed date with many features of the Decorated style indicating a date earlier than most church build in Norfolk. There is also, however, much that is typically Perpendicular and the church was probably built across many years and absorbed the fashions of each. A feature of the building is the unusual usage of "red chalk" from the cliffs of Hunstanton. An airfield was built in the east of the parish during World War Two. This was a base for Blenheim and Boston bombers, and for a Mosquito squadron. The airmen working at the base used St Andrew’s Church. Several military graves can still be seen in the graveyard. The lead on the roof of the church contains an interesting selection of 19th century to modern graffiti including some examples probably written during World War Two by firewatchers. Inside this delightful but small church is a roll of honour that lists enormous amounts of information about the crews who served at the nearby base. It gives aircraft details, mission dates and crew names amongst others. It is a hugely detailed collection of information covering 1940-45 in which time 600 Massingham crews lost their lives. Seven of these crew members, are buried in the church yard here. The Church, like our Church in Congham, is dedicated to St Andrew and you can read more about St Andrew, Jesus's "first Apostle" here.